CES 2009: Slacker Available for BlackBerry Smartphones! LAS VEGAS - January 8, 2009 - Slacker, Inc. today announced the availability of the free Slacker Mobile application for BlackBerry® smartphones from Research In Motion (RIM) (Nasdaq: RIMM; TSX: RIM). BlackBerry smartphone users* can now hear their favorite Slacker radio stations wherever they go, whether they are connected to a wireless network or not - a Slacker Mobile feature exclusive to BlackBerry smartphones. The application, which is compatible with BlackBerry® Device Software version 4.3 and higher is available as a free download by visiting Slacker.com from your BlackBerry smartphone. The Slacker Mobile application provides BlackBerry smartphone users in the U.S. with a personalized music discovery and listening experience pulling from over 100 expert- programmed Slacker stations, over 10,000 artist stations or a nearly unlimited number of the listener's own custom-created stations. Slacker station caching, an exclusive feature for BlackBerry smartphones, enables mobile listeners to store favorite stations on a memory card, allowing Slacker music service to play without a network connection while boosting battery life up to 5 times that of streaming playback and enhancing application performance. In addition, BlackBerry smartphone enthusiasts can enjoy Slacker Personal Radio while doing other tasks such as emailing, instant messaging or web browsing. The groundbreaking Slacker music service enables listeners to enjoy Personal Radio stations and hear their favorite music without ever having to manage playlists or research new artists. Included in the Slacker application for BlackBerry smartphones are detailed artist bios and album reviews for each song that is played, providing the ultimate resource for music discovery. The Slacker Mobile application works with the free Slacker Basic Radio service, along with Slacker Radio Plus and Slacker Premium Radio subscription offerings. 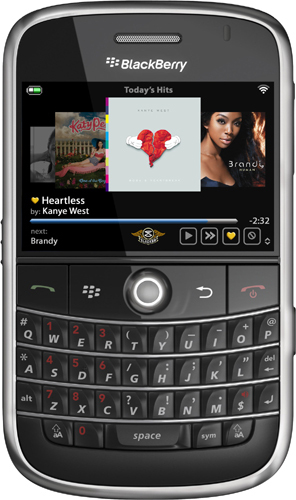 "Slacker Mobile makes your BlackBerry smartphone the ultimate personal radio player," said Dennis Mudd, CEO of Slacker. "And because of our caching technology, BlackBerry owners can play their personal radio stations everywhere, even on subways and planes, with much better battery life and faster song skipping than is possible with streaming stations." "Our new BlackBerry smartphones provide truly impressive audio and video performance that allows the smartphones to serve as powerful and conveniently accessible personal entertainment devices for consumers and business users alike," said Jeff McDowell, Vice President, Global Alliances at Research In Motion. "With access to millions of songs and easily customized programming, it's no surprise that people are excited by this new application." Slacker Personal Radio, available online at www.Slacker.com, enables listeners to personalize over 100 professionally programmed stations or create, edit and share their own Personal Radio stations. Slacker listeners also have easy access to artist profiles, album reviews and cover art on the web, with the Slacker G2 portable and now on BlackBerry smartphones. The Slacker Personal Radio Mobile application for BlackBerry smartphones is available immediately as a free download by visiting Slacker.com from your BlackBerry web browser or visit www.slacker.com/blackberry for more details. Slacker is the world's first Personal Radio company offering "Your Radio Everywhere." Slacker allows music lovers to play highly personalized music online at the Slacker web site or on the go with Slacker Personal Radio players. Visit www.slacker.com for more information. *The Slacker Personal Radio Mobile application is currently available for U.S. customers only. Slacker Mobile for BlackBerry is available for BlackBerry smartphones running operating system 4.3 or higher with the exception of the BlackBerry Storm which will be fully supported in a future release.